It’s of no surprise that in the past couple of years the fastest growing field has been that of Social Media. Its impact upon the speed of worldwide travel of public information was nigh unprecedented, but what has become almost more important than this is the way that HR and recruiters can use it in the workplace. When entering the grueling world of job seeking, people always lament the age-old saying, “It’s not what you know, it’s who you know.” While that may be partially true, as networking has never been easier with the use of social media tools, what really matters now simply is, who knows you. Making yourself known across multiple social media platforms and increasing your Klout Score is just as important, if not more, than what employers read on your CV. HR Officers can get a better idea of who you are, your interests, your social circle, and how much of a social presence you have just by doing things like simply Google searching your name or using data-mining technologies that are helping make HR more effective, and a lot quicker. In truth, resumes/CVs are only a small portion of what employers look at now a days – they want to check in with you and see you how you are, off paper. Another trend that employers are definitely going to have to jump on the bandwagon for is making their sites mobile-friendly. The world has literally gone mobile. Hardly anyone doesn’t have a smartphone in this day and age, and to make your business more attractive, it’s imperative to optimize your site able to be seen on mobile devices, that way you reach a much bigger audience. An audience which, will be composed of the young generation, Generation Y. A type of generation, that with each passing year, will experience enhanced quality and range of technology. These younger generations will throw themselves deeper and deeper into the wireless communications world. HR will see an increase in globalization, which will undoubtedly lead to more cultural diversity. The question is, how can HR and different companies communicate effectively with this increasing diversity? The answer could be in MOOCs. 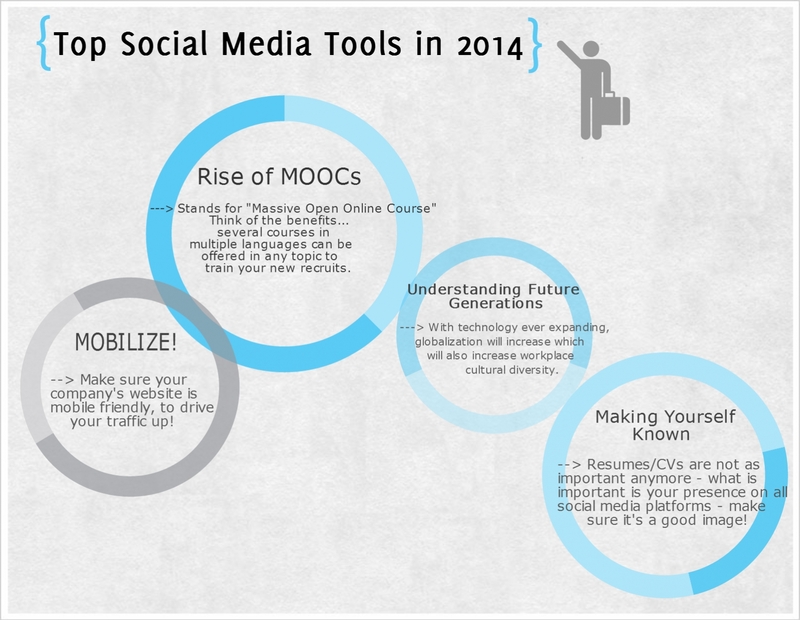 This is a trend that is due to bloom in 2014 is that of MOOCs (massive open online course). In September of 2013, edX, a American non-profit online learning initiative, combined its powerful education tools with Google. With this combination, Google will help them to launch a platform that will enable the courses to reach far beyond any campus. The significance is that with this platform, people can host courses for a global audience. Employers will be able to take this increasing cultural diversity of Generation Y, and reach out to every single person to be able to augment their employees’ skills. Having social media skills is now an absolute must for any HR officer, and the most important thing that HR can do is to integrate social technologies such as these into their recruitment and development practices to be ready for the social media and technology trends to come in 2014. This entry was posted in General Posts and tagged Generation Y, HR Agencies, HR Officers, HR Technology, Job Recruiters, job search, Job Search UK, Klout, Klout Score, MOOC, recruiters, social media, Social Media Tools, Social Media Trends, Social Media Trends 2014. Bookmark the permalink. ← How has JobCentre Plus increased their efficiency?